Step 1 In a large, heavy-bottomed pot, heat milk until it just starts to steam. Gradually pour in the polenta, whisking constantly to avoid lumps. Adjust the heat to medium and cook, stirring occasionally, until the polenta begins to bloom and absorb the milk, about 10 minutes. Step 3Heat a sauté pan large enough to hold all the cauliflower leaves without crowding, or work in batches. Coat the pan with about 2 tablespoons of olive oil over medium-high heat until just shimmering. Add the cauliflower leaves and sauté quickly until they barely wilt and start to become tender but are still bright and crunchy, 5 to 6 minutes. Season with 1/2 teaspoon salt, or to taste, and freshly cracked black pepper. Step 4Spoon the warm polenta into individual bowls or a large serving bowl (approximately 1/2 cup polenta for each serving). Spoon the leaves on top of the polenta and sprinkle with a little Parmigiano-Reggiano cheese to garnish, crack some pepper on top and drizzle liberally with extra-virgin olive oil. In Recipes-list.com we have selected the most viewed recipes from category - Vegetables . Enjoy the best recipes specially selected for you! 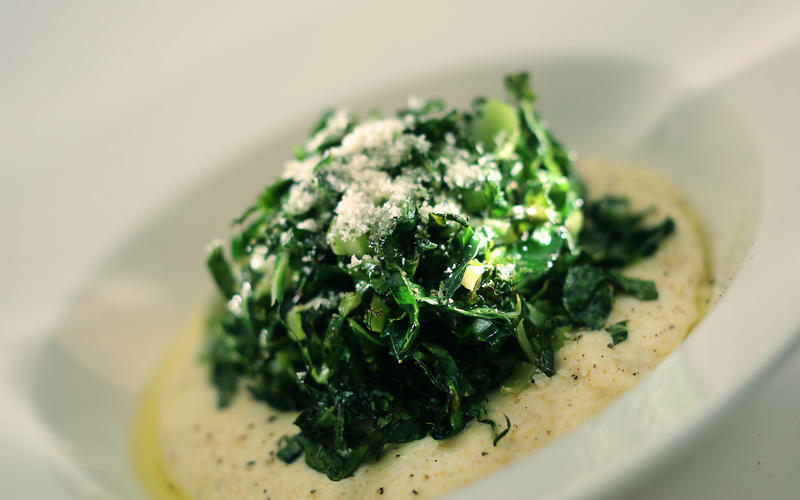 Sautéed cauliflower leaves with soft mascarpone polenta is the right choice that will satisfy all your claims.